Truly, truly, homemade cookies are the best. And peanut butter makes them too good to resist. These little cookie sandwiches are my Mardi Gras indulgence. And they are held together with my Chocolate Peanut Butter Lentil Frosting. 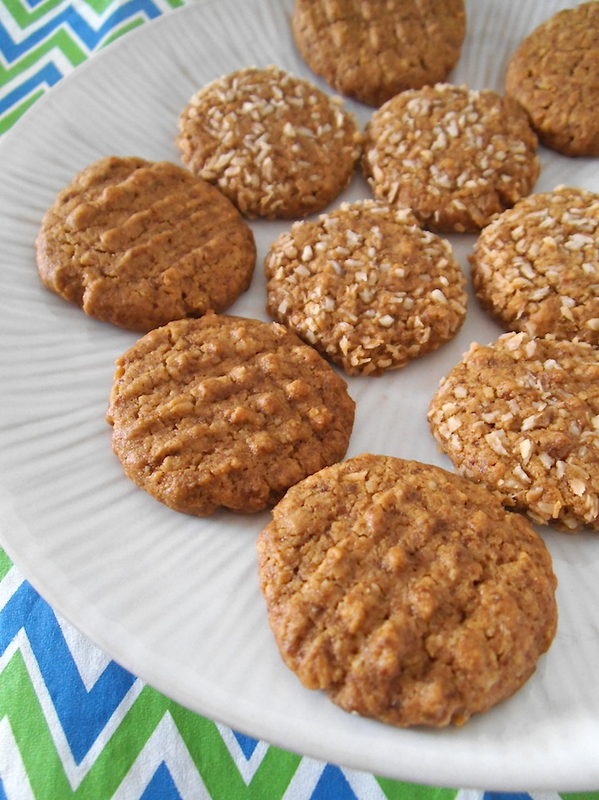 Because leftover frosting prompted me to make cookies–specifically peanut butter cookies. Peanut butter and coconut are go-to items that I eat all the time. I spread peanut butter on bread and sprinkle it with coconut for a protein-rich anytime snack. Or I swirl the two of them into my morning oatmeal. 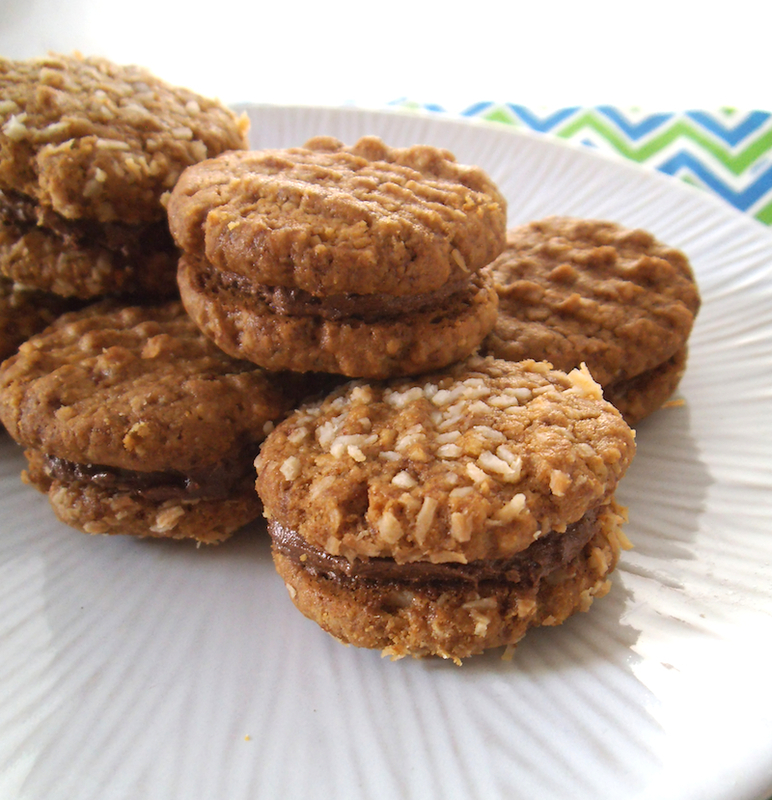 And when peanut butter and coconut are fused together in cookies that are sandwiched together with chocolate frosting? We have a definite winner. Mix together 1/2 cup coconut flakes, oat flour, and baking soda. Stir in peanut butter, brown sugar, egg and vanilla until an evenly mixed dough forms. Preheat oven to 325 degrees F (170 C). Scoop out rounded teaspoons of cookie dough and shape into round balls. Roll in additional coconut flakes if desired, or leave plain. Use the back of a fork to press dough balls flat onto a baking sheet (lined with parchment). Bake cookies for 10 to 12 minutes until bottoms turn golden. Let cookies cool for 1 minute on the tray. Carefully transfer them to a cooling rack. Cool completely. Spread the bottom of one cookie with Chocolate Peanut Butter Lentil Buttercream Frosting. Add another cookie to make a sandwich. Repeat until all sandwiches are assembled. After the Valentine indulgences I was trying to be good and here you come with this irresisitable temptation! Well, I did try to make them on the smaller side. 🙂 And they’d be fun to share with friends. Actually I was thinking they’d be my one last hurrah before Lent. 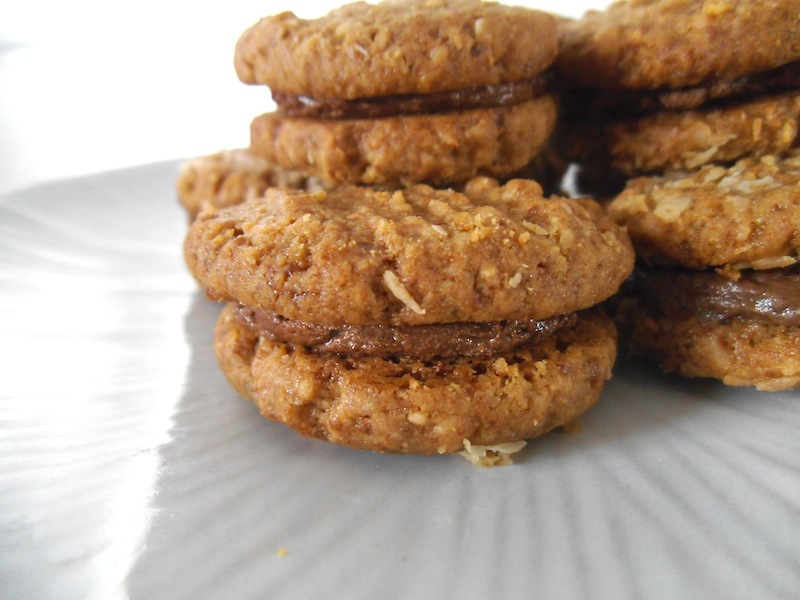 You can never go wrong with peanut butter cookies and in sandwich form they sound even more irresistible! Love the hidden lentils in the frosting! I have to admit I did a slight double take when I saw the words “lentil” and “frosting” together, but heck, I love lentils and always have them around, so why not?! These cookies look marvelous! With the peanut butter in the frosting, you can’t. Really distinguish the lentils. They add thickness and nutrients too. You should check out all the rlentil recipes on the Recipe Revelations Pinterest board. Amazing! There’s a link in my recent cupcake post. Ian so wanting a cookie and one with peanut butter would be perfect! Peanut butter is always a good idea!